This High Lifting Ratchet Farm Jack Is Great For Lifting Vehicles For Repairs Off Road. 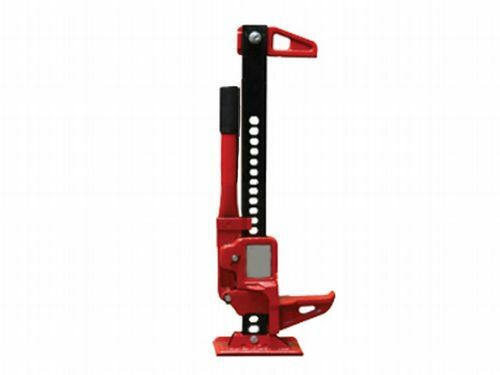 Our High Lift Ratchet Farm Jack Is Suitable For Lifting Up Cars When Off Road. For lifting up your vehicle when off road, use our high lift farm jack. The perfect tool for jacking up your vehicle when off road. Here at SecureFix Direct our farm jacks are ideal for lifting, lowering, clamping, pulling, pushing and has an endless amount of uses. We have a range of sizes when it comes to our farm jacks so ensure you select the right one for you. If you need any help choosing the right farm jack for you and your needs, our team will be more than happy to help. Our high lifting ratchet farm jacks can be used with posts, poles, trucks, cars caravans, 4x4's and many more. At SecureFix Direct we understand our customer and their needs, that is why our farm jacks are highly durable and have a heavy duty ratchet system. Each and every farm jack has a large plate to ensure the load is spread evenly, particularly on soft ground. When it comes to our high lifting ratchet farm jacks they are versatile with many uses for both indoor and outdoor applications. Here at SecureFix Direct we know the importance of safety, so please ensure maximum capacity is not exceeded. For those of you with any questions or would like any more information on our farm jacks, simply get in touch with our dedicated customer support team. At SecureFix Direct our team is always more than happy to help. We’re confident that you will not be disappointed with the quality of our farm jacks so place your order with us today. We understand that our customers need high quality and durable products, and that is exactly what they get when they shop with SecureFix Direct. Here at SecureFix Direct we have many years of experience and only provide the best lifting products at the most competitive prices. Not only that, but we also offer a free and fast delivery service, and we always aim to dispatch your order as soon as possible. For further details about our service or products contact a friendly member of our team today.